Hey, it’s almost asparagus season! 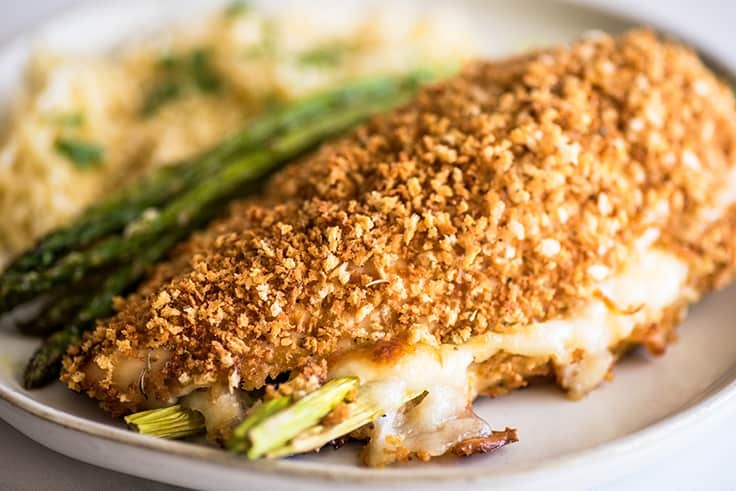 Here in California, asparagus season runs about February through June, and in preparation for that happy time, I’m sharing one of my favorite easy asparagus recipes: Asparagus-stuffed Chicken Breasts. This is a great, simple dinner that’s easy enough for weeknights, but looks good enough to serve for company when you need something fool-proof and delicious. It’s also one of those dishes that you have to work really hard to mess up. As long as you have an instant-read thermometer and remember to check on your chicken so you don’t burn or over-cook it, dinner’s going to be great. This recipe starts with butterflied chicken breasts (watch this video if you’ve never butterflied chicken breasts before) dipped in whisked egg to act as a binder and rolled in a combination of panko, Italian seasoning, salt, and pepper. In the oven, it will crisp up and form a crispy, crunchy coating on the chicken. Asparagus chicken goes very well with orzo (I always serve it with my fav Parmesan Orzo) or rice. You can roast additional asparagus and serve alongside or pair with a different green veggie like Roasted Broccoli or Butter and Garlic Green Beans. This recipe calls for thin asparagus spears, as that’s my personal preference. You can use medium/average size spears if that’s what you can find, but stay away from the really thick spears. They make the chicken awkward to cut and eat and don’t have the best texture. Similarly, don’t use enormous chicken breasts. Your asparagus will burn before the chicken cooks all the way through. Toasting the panko in this recipe is optional. 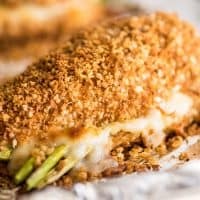 It produces a nicer golden-colored crust, and the flavor is a little toastier, but the chicken still tastes great with untoasted panko. To be honest, I usually do this step for guests but skip it when I’m making it on a busy weeknight. For more easy chicken recipes, try Salsa Chicken, Oven-roasted Chicken, and Pesto Chicken Pasta. 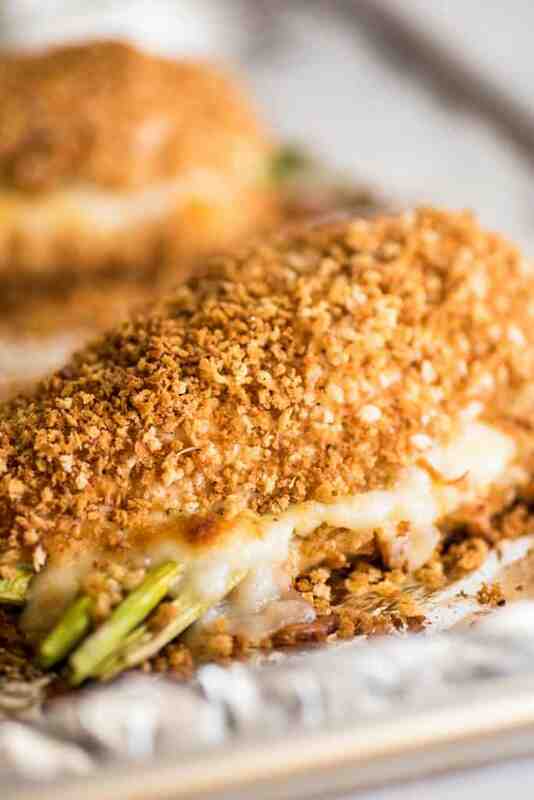 As written, this Asparagus-stuffed Chicken Breast recipe serves two. To change the recipe yield, hover over the number of servings (or click if you are on mobile) and slide the slider–no preparation changes are necessary for doubling, except, you might not need two eggs to act as a binder. Start with one and use the second only if necessary. Preheat your oven to 375°F and lightly grease a baking sheet. Heat a medium skillet over medium heat. Lightly grease with cooking spray or about a teaspoon of cooking oil. Add panko and toast, stirring almost constantly once it begins to brown, until golden in color, about 5 minutes. Transfer panko to a medium container large enough to dip a chicken breast into and set aside. Butterfly each chicken breast by placing one hand flat on the top of the breast and slicing horizontally almost all the way through, so you have thin, even pieces on the top and bottom and you can open it like a book. In a medium container, large enough to dip a chicken breast, crack and whisk egg, set aside. Into the panko, stir Italian seasoning, salt, and pepper. Dip closed chicken breasts first in the egg then in the panko, coating the top and bottom, and place on prepared baking sheet. Don’t discard any extra panko. 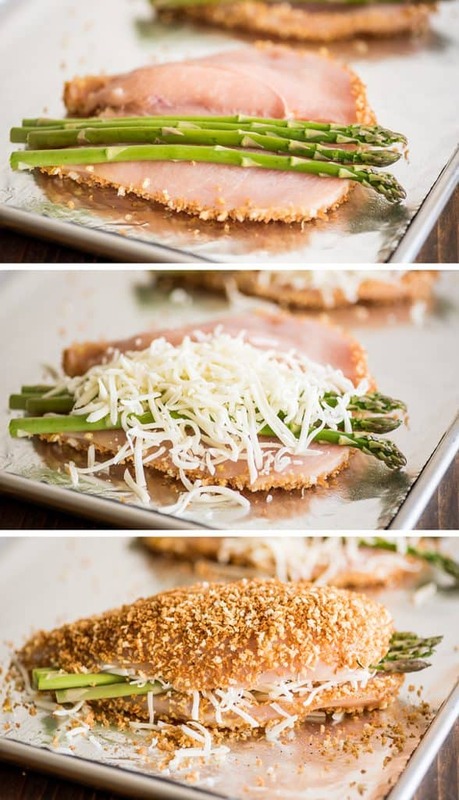 Open chicken breasts and place 4 spears of asparagus inside of each and top each with 1/4 cup of cheese. Close chicken breasts and sprinkle any remaining panko over the top. Bake for 25 to 35 minutes, until an instant-read thermometer inserted into the thickest part of the breast reads 165°F. Allow chicken to rest for at least 5 minutes before serving. Enjoy! *You can also use regular bread crumbs. If using bread crumbs, skip the toasting step and go right to coating the chicken.